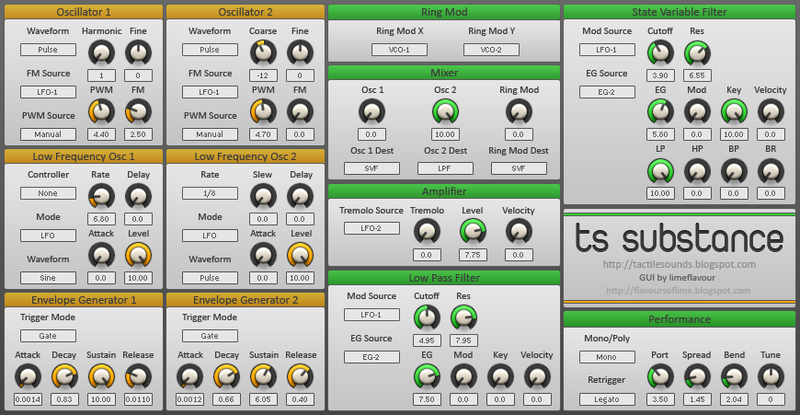 Tactile Sounds has launched Substance, a new FreewareSynthesizer For Windows. "Substance has two of everything: two oscillator sections, two LFOs, two envelopes, two filters. The oscillator sections were inspired by the architecture of classic analog polysynths, which used multiple oscillators to achieve polyphony, but allowed the oscillators to be combined for a monophonic Unison mode. The oscillators would generally be slightly out of tune with one another, resulting in a rich, chorused sound. Each of Substance's oscillators likewise comprises seven unison voices, with the amount of detuning, and the stereo breadth being adressed by a single parameter, Spread. The LFOs can be used to modulate almost every parameter of the synth. They can be used to trigger the envelopes, to modulate the frequency and pulse-width of the oscillators, the cutoff frequency of the filters, and the volume of the amplifier. LFO-1 can be switched between free-running, tempo-synced, and key-synced modes. A manual is included in the download link, detailing all of the other features." Find more Free Music Software!